When Erich Pfeifer was in his mid-20s, he was spending half the year on the road as a sales engineer for his family’s company, Marine Travelift. He worked closely with clients around the world, asking what they needed in boat-moving equipment and collaborating with the home office to meet those requests. “Initially, I would just talk to somebody about what they wanted in a machine. Then they bought the equipment and their dream became reality. Watching their business grow is the most rewarding part of this job,” he said. Now 38, he’s president and CEO of Marine Travelift, having worked his way up through the ranks. The company offers full lines of mobile boat lifts, marine forklifts and self-propelled trailers. The Pfeifer family also owns ExacTech Inc. and Shuttlelift, a manufacturer of material-handling machines. All are headquartered in Sturgeon Bay, Wisconsin. Erich and his wife Barbara live in Sturgeon Bay with their yellow lab and miniature pinscher. When not visiting customers, Erich enjoys salmon fishing on Lake Michigan in the 1987 Pursuit 25-foot center console that used to belong to his grandfather as well as golfing and cross-country skiing. We caught up with him at the home office. How are things going at Marine Travelift? Things are good right now. We have a lot of different product lines and we’re in a lot of different markets. What are the different lines? We have the mobile boat lifts that everybody thinks of when they hear our name. We also have a full marina forklift line that serves the drystack industry and we have self-propelled transporters that are great for moving boats around a yard or marina. What are some things that have been going on lately at the company? How did Marine Travelift get started? 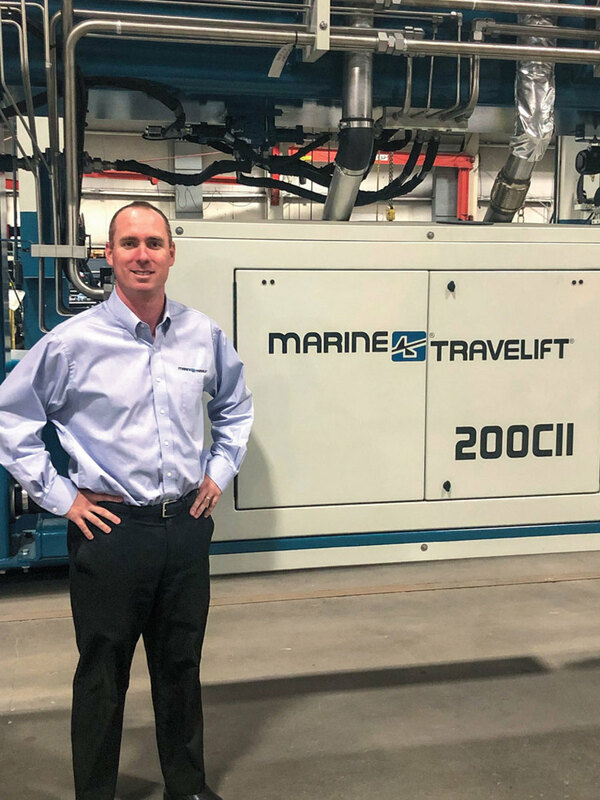 Marine Travelift was invented and founded in Sturgeon Bay in the mid- to late-1940s by a gentleman with the last name of Baudouin who worked at the Yacht Club of Sturgeon Bay. He invented the concept and built the first one. It was successful and he started building them for friends at other marinas. From there, the concept took off and the company became incorporated in the mid-1950s. Is it safe to say that you have more of a vested interest in the company than a typical employee? My family bought the business in 2003, and I started in 2004. I took over as president and CEO in 2011. My dad, Steve Pfeifer, owns ExacTech, a large fabrication facility that builds really big things out of steel. We can lift 100-ton parts up to 140 feet long, which is great for building some parts for Marine Travelift, and we make structures for the mining and other industries. We also have Shuttlelift, a company that makes materials handling equipment. How did the relationship between your family and Marine Travelift start? My dad started ExacTech in the early 1990s near Milwaukee and in the late 1990s, ExacTech was building structures for larger Marine Travelift products such as an 800-ton model shipped to Singapore. ExacTech built the steel structure so that’s how the relationship developed. 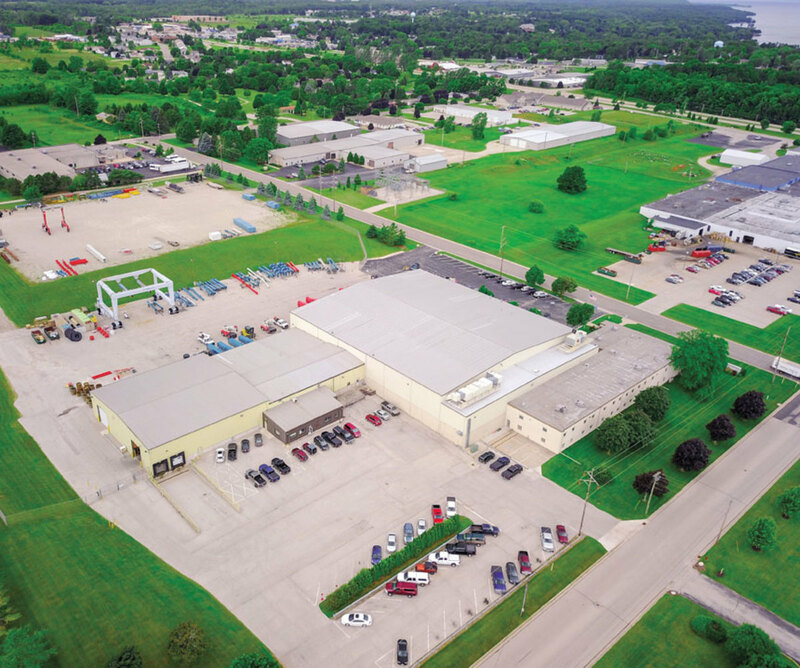 When the previous owners decided to sell, there was an opportunity to purchase the company and then we expanded up here quite a bit when we moved ExacTech to Sturgeon Bay in 2005. Can you describe your path from sales engineer to president? As a sales engineer, my mission was to support the worldwide dealer network from a technical standpoint. It allowed me to learn the product line inside and out, which was critical. It also allowed me to travel the world working with all these different distributors and customers. After that, I became the sales manager and soon after, I was 28 when I became VP of business development. By that point, I was very familiar with the product lines, the customers’ needs and was heavily involved in product development. Then I went to business school full time at University of Wisconsin in the executive MBA program, which I completed in 2011. A few months after that, I took over as president. Did you work in either of your dad’s other companies? Yes, when I was a teenager, I worked at ExacTech on the shop floor, so I understood welding, machining, fabrication, and forming at an early age. It really helped me focus on the Marine Travelift business when I moved over to that company. This mobile lift is one of the three types of boat-transporting equipment that the company builds. What was it like working for your dad? It was fine because there was a lot of communication. We knew each other’s behavioral traits and we both had the same goals. He handled a lot of the corporate stuff and I handled the sales stuff. For us it worked really, really well. It helped it was just him and me in the business. That’s pretty ambitious, taking over as president at such a young age. Have you always been driven? I never really had the goal to do all this. It just kind of happened. Were you competitive growing up? I was a serious soccer player, but I blew out my ACL in the eighth grade. By the time I was fully recovered, it was the second half of my junior year, so sports were pretty much done for me. You mentioned that you traveled a lot early on. How much time did you spend on the road in the early days and how about now? I was on the road about 50 percent of the year in my early years and now it’s about 30 percent. How much area do the three companies cover in Sturgeon Bay? We have two campuses about a quarter mile apart and that’s how the two companies came together over time. We have three buildings that cover more than 200,000 square feet. Having everything on two campuses is a way more efficient way to manufacture. Do you have favorite places that you travel to? Norway is amazing. So are New Zealand and Australia. Those would be my top three places. Given the size of the machines you produce, how tall are some of the buildings? The door heights are close to 50 feet. We have 200 employees. Marine Travelift, ExacTech and Shuttlelift are all divisions, but many people such as the finance and payroll departments and some sales persons work for all three companies. 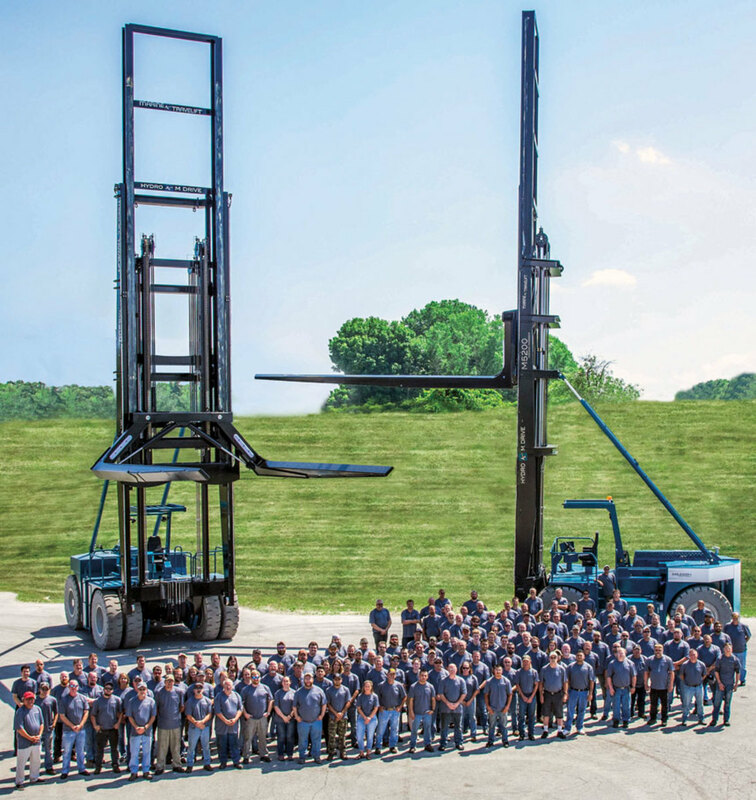 Marine Travelift employees have built some of the world’s largest boat-moving machinery. What is Marine Travelift doing to attract and retain employees? Our employees are very proud of the work they do, knowing that the products they build are going around the world. We also think we build some really cool products. As a result of that you get to meet interesting people. By having the cool factor and offering interesting work we’re able to retain talented people. We have a lot of people who’ve been here 15, 20, and even 25 years. What were some keys to the company’s early growth? Self-propelled machines, and then came the gated lift that we would call the AMG today. The back beam would open up and the boat would drive in. Is it true that eliminating the gate was a key move in the company’s growth? That was the introduction of our AMO model and the O stands for “Open.” Having no more gate or beam along with self-propulsion is when the company started to take off. It was such a game-changer because it was so much more efficient to use. That type of innovation is part of the company’s culture. It’s like the wireless remote control we have today. A marina or boatyard can lift more boats faster and safer. Do you build custom or do you have standard models? The answer is sort of both. We have standard models, but everything is custom in the sense that everyone has piers with different widths. They all have different buildings too, so heights might be a little different. If there are sailboats or powerboats or a mixture, a machine will need different options to accommodate them. For example, a yard working with sailboats might have our top-beam extension that pushes the top beam forward so the yard doesn’t have to remove the forestay. What are some recent innovations you’ve made with the equipment? A very popular option is the wireless remote control. It’s a screen that provides all the load indication information, all the machine’s telematics and the engine information. It also allows us to do remote diagnostics from the factory and other locations. New technology on the machines allows customers to have lower total operation costs. What is your most popular machine? Domestically, a very popular machine is our 75- to 85-ton capacity mobile lift. How long do customers keep your equipment? Yards keep mobile boat hoists about 15 to 20 years and 7 to 10 years for the forklifts. We have more than 400 units in the Northeast and the average age is 26 years. How many countries do you sell to? We sell throughout Europe, the Middle East, Asia and Oceana, South America, Central America and the Caribbean. Any country that has recreational boating or ports that require support for tug boats, offshore oil vessels or fishing vessels we support and serve, so we are truly an international company. It’s a lot of fun. Marine Travelift, ExacTech and Shuttlelift are within a quarter mile of each other. How long does it take to build a machine? One of the things we’re big into is speed to market, being able to respond to customers quickly and being able to deliver and provide service and solutions quickly. For a BFM2, which is a 15- to 100-ton machine, from the time of order to delivery at the customer’s site is three to four months. For most of our forklifts, it’s the same. When you get into really big machines used for lifting superyachts in the 600, 700- and 800-ton range, those lead times can be 8 to 10 months. What is the breakdown in your customers between boatyards and boat manufacturers? The larger percentage is boatyards and marinas, but we support boat manufacturers like Hatteras, Viking, Burger Boats, Westport Yachts, Cruisers Yachts, Carver, and Boston Whaler. Given the growth of dry stack facilities, did you have equipment to serve that segment in place or did you have to react? We saw it coming. Some people don’t realize that Marine Travelift has been in the forklift business for almost 30 years. We have a lot of machines from the early 1990s that were 20,000- to 27,000-pound forklifts so dry stacks and marina forklifts aren’t a new thing to us. Have you since expanded your product lines to meet demand? Over the past three to five years, we’ve rounded out a complete line of forklifts ranging from 15,000 pounds to 52,000 pounds. We have a full capacity line and a range of wheelbase capacities so we have some of the shortest wheelbases in the industry. The shortest wheelbase provides the shortest overall length of the machine, which allows for the tightest turning radiuses. That’s critical as dry-stack facilities want to lift larger boats in the same footprint. We have center cabs for people who prefer that, or we have side cabs for people who need that configuration. What is the largest forklift that your company currently makes? The largest built to date is a 52,000-pound model that will lift up to 45- to 50-foot boats. 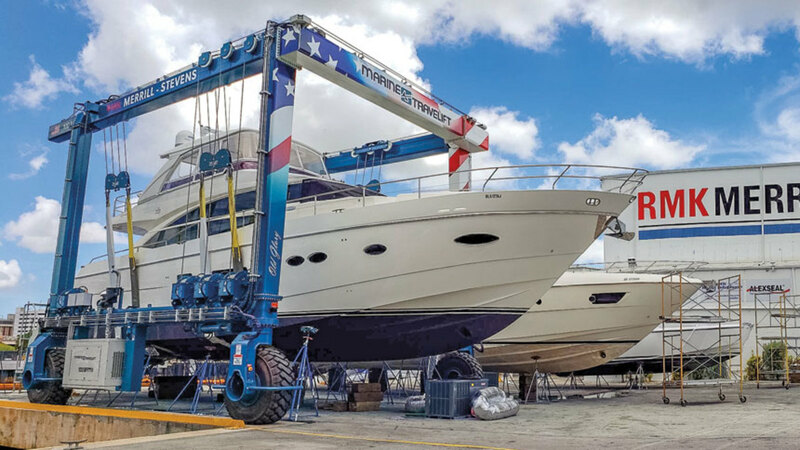 Are you surprised by the size of boats marinas are picking up with forklifts for rack storage? Boats are getting bigger and space is at a premium. It’s not surprising, but the word I would use is impressive. These operations are fast and efficient, and they make it look really easy. The company has been around for decades. How did it overcome financial challenges like the downturn of 2008? We’re not just in marinas. We’re also in shipyards supporting commercial fishing and offshore oil vessels such as tugs, barges, push boats, etc., so we’re in a lot of diverse markets. All the different markets we serve around the world provide some stability. Plus with ExacTech, we build really big equipment for mining companies. During the downturn, mining was really busy. We’re in enough different industries to keep our workforce together to take care of our customers. Another challenge facing the marine industry right now is the tariffs on aluminum and steel. How are these affecting your company? The tariffs are affecting us from our supply-chain standpoint. We use suppliers in Wisconsin and the Midwest and the way the tariffs have affected us the most is with our steel structures, because prices have gone up. We use U.S. steel instead of foreign steel, so people say, if you’re using U.S. steel, how are the tariffs affecting you? The answer is because the foreign steel prices have gone up, so U.S. manufacturers are raising their prices. We’re not paying the tariffs, but they are still affecting us. Do you agree with the intent of the tariffs? I agree that there needs to be a free market with fair trade. That’s what I agree with. What I mean by free market is no tariffs and no protectionism. For example, a lot of stuff that goes into Europe, there are tariffs or different specification requirements that increase the cost of products, which makes the product less competitive in Europe. There’s an issue out there in the world and there needs to be more fair trade and fair markets. How much do you sell domestic versus international? It has been as little as 30 percent domestic and as high as 50 percent over the past 15 to 20 years. Are you active in the marine industry in any organizations? We’re part of the Marine Recreation Association in California, part of American Marina Institute conferences and we’re involved in local trade associations throughout the nation and around the world. We want to continue to keep customers happy. What does that mean? Allowing us to be a partner and help them grow. Five years from now, we want to continue to be the leader in mobile-boat hoists, marine forklifts and yard transporters. We want to be a marina’s single source for boat handling.